‘Ero straniero. L’umanità che fa bene.’ There could not be a more fitting, emotional, rational, secular, spiritual, profound, rich, evocative title for a campaign that seeks to change the narrative on immigration. 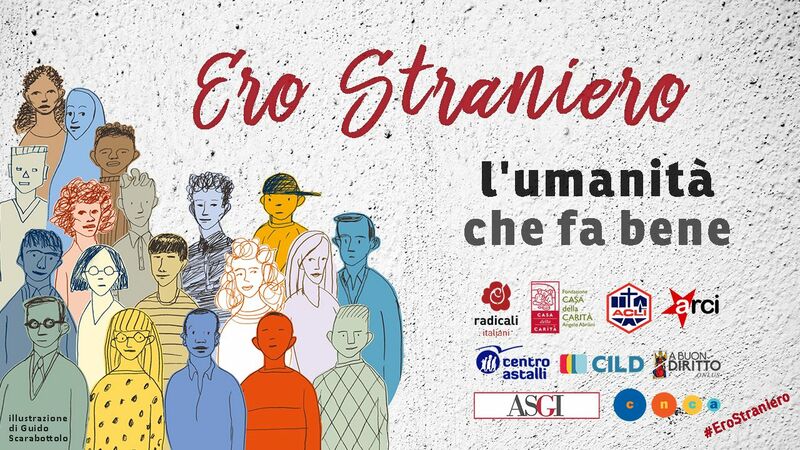 ‘Ero straniero’ had the objective of collecting at least 50,000 signatures for a popular legislative initiative to improve the Bossi-Fini law on immigration, which has resisted the efforts of the left and right governments to change the legislation, and is the root cause of current problems. This law has had negative repercussions on security and integration, and treated hundreds of thousands of people as illegal aliens, making them vulnerable, undocumented, unsafe, and potential criminals. This is the most suitable moment to go on the streets, in the universities, in the public and religious institutions and discuss migrants, their rights, our respective cultural, social, political, and economic needs. According to Kant, humanity is human dignity. Human dignity is ontologically opposed to decorum that is instead the foundation of the new security law, which is strongly desired by the Minister of the Interior Marco Minniti. Human dignity is a universal value that all human beings should have. It is an intrinsic human trait. Deprived of their humanity, human beings do not fully exist. To annihilate human dignity, wrote Hannah Arendt, means to annihilate the human being. Human dignity is the foundation of all human rights, according to Stefano Rodotà. On the other hand, decorum is a quality that is limited to and representative of a small number of people. It is an exclusive and individualistic characteristic. To be decorous, an individual must be sober, honest, and socially integrated. ‘L’umanità che fa bene’ stands in opposition to the rhetoric of decorum. As representing members of the Italian civil society, we invite those who believe in the intangibility of human dignity to sign the popular legislative initiative, which has received strong support from Emma Bonino and Don Virginio Colmegna. We thank them for bridging the gap between different but proximate realities. With them, and we remain hopeful that many other people will also be present, on the 20th of May, we will be in Milan celebrating “20 maggio senza muri”, a march for promoting diversity organised by the Municipality of Milan. This is an opportunity for us to counter the rhetoric of fear and champion a narrative based on reason, dialogue, and humanity that does-good.